Enjoy The Most Inclusive Luxury Cruise ExperienceTM Ever. This is cruising as it was meant to be — a world where everything is included, without exception and without compromise. Personal service soars into the sublime aboard our elegant ships, liberating you to follow your heart, fulfill your desires, and explore exciting new places in complete and absolute comfort. Expect gratifying luxuries. Anticipate the world’s most exotic destinations. Indulge in world-class cuisine. Trust that your voyage will be enlightening in ways you never imagined. Regent Seven Seas Cruises promises an extraordinary experience. Enjoy … It’s all included. Enjoy bonus savings of up to $8,400 per suite off of the 2-for-1 all-inclusive cruise fares. Indulge in the comfort of luxury from the very start of your journey with FREE Roundtrip Business Class Air* on all Intercontinental flights or enjoy FREE Roundtrip Air* on all Domestic flights. Also extend your vacation with our FREE 3-Night pre- or post-Cruise Land Program on select voyages. FREE Business Class Air applies to intercontinental flights only in all suite categories and includes ground transfers and applies to flights only from the following airports: ATL, BOS, CLT, DEN, DFW, DTW, EWR, FLL, HNL, IAD, IAH, JFK, LAX, LGA, MCO, MDW, MIA, MSP, ORD, PBI, PHL, PHX, SAN, SAV, SEA, SFO, TPA, YUL, YVR, YYZ. Airfare is available from all other U.S. and Canadian gateways for an additional charge. FREE AIR from Honolulu (HNL) is available on new bookings on 2018 Mediterranean and 2018 Alaska voyages made between 2/19/18 and 5/20/18, and is combinable with all offers. All airline fees, surcharges and government taxes, airline-imposed personal charges such as baggage fees may apply. Custom Air arrangements may be made 270 days prior to sailing (custom air frees apply). 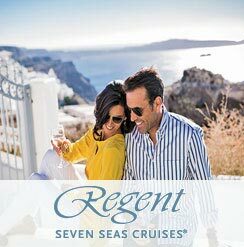 Guests who elect not to participate in the FREE Air Program or do not purchase transfer arrangements from Regent Seven Seas Cruises® will be responsible for their own transfer arrangements to and from the ship.